Popovers – when they work – are one of the easiest and most impressive quick breads. When they don’t work they often wind up as a doughy lump that no one wants to eat. There has been a lot written about what it takes to make a successful popover. Some insist that the oven needs to be hot. Others say it works just as well to start the popovers in a cold oven. Still others say that the batter needs to be poured into a hot pan before it is put in the oven. I have not done an exhaustive study of the issue, but for me pouring room-temperature batter into a pan that has been heated in the oven as the oven gets to baking temperature has always worked. Some say that you should only use a special popover pan, usually with six cups. Others say a 12-place muffin pan works better and you wind up with twice as many popovers. Again, I haven’t done a scientific study, but either seems to work just fine. Some say that the pans must be heavily buttered with at least a tablespoon of butter in each cup. 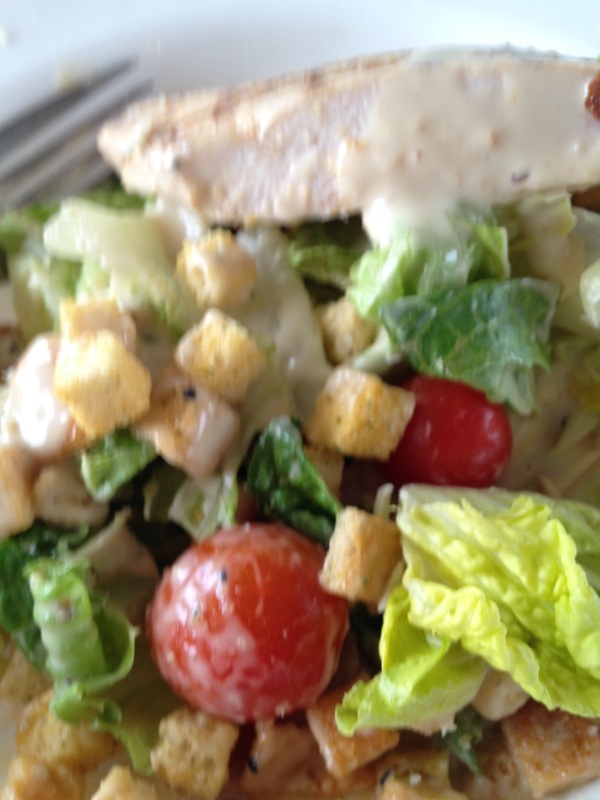 Others say that a little salad oil in each cup works just fine. I have tried both, and while I don’t know the real food chemistry, I believe that a good coat of a solid fat like butter is important to let the batter creep up the sides of the cup. I have had successes and failures with oil, but a good coating of butter (although not the mega dose that some recipes call for) always seems to work. Some say that a lower constant baking temperature works just as well as a beginning hot temperature reduced to a lower temperature. I favor the latter. I’ve watched through an oven window with the light on many times, and the popping seems to be over at the end of 15-20 minutes of high temperature baking. The lower temperature crisps the popovers without burning them. Some say you should pierce the popover half way through the baking to make sure the inside loses its “eggy” consistency and flavor. I think that can be dealt with by just baking the popovers a little longer. You can use different flours or add a teaspoon of grated cheese or other flavoring, but the popovers will probably not rise as impressively. Finally, I also believe that a well-mixed smooth batter at room temperature is key to success. Here are some popovers Carol and I made during our recent visit in her home. Generously coat the cups of the preferred baking tin with butter. Place in the middle of the oven and turn the oven on to 450°F to heat the pan and the oven. In the meantime, Combine the four and salt in a 4-cup measuring cup or a large mixing bowl with a pouring spout. Beat the eggs until light and well-mixed. Stir in the milk and butter. Add the liquid mixture to the dry ingredients. With a whisk or mixer beat the batter for a minute or two until well-blended and smooth. When the oven has reached temperature, remove the heated baking pan to a trivet or heat-proof surface. Bake undisturbed for 20 minutes. Then reduce the oven temperature to 350°F and bake for an additional 20 minutes. Remove from the oven. Loosen each popover by running a thin knife around the edge, and transfer to a serving basket. Serve immediately while still warm, with lots of butter and/or jam. 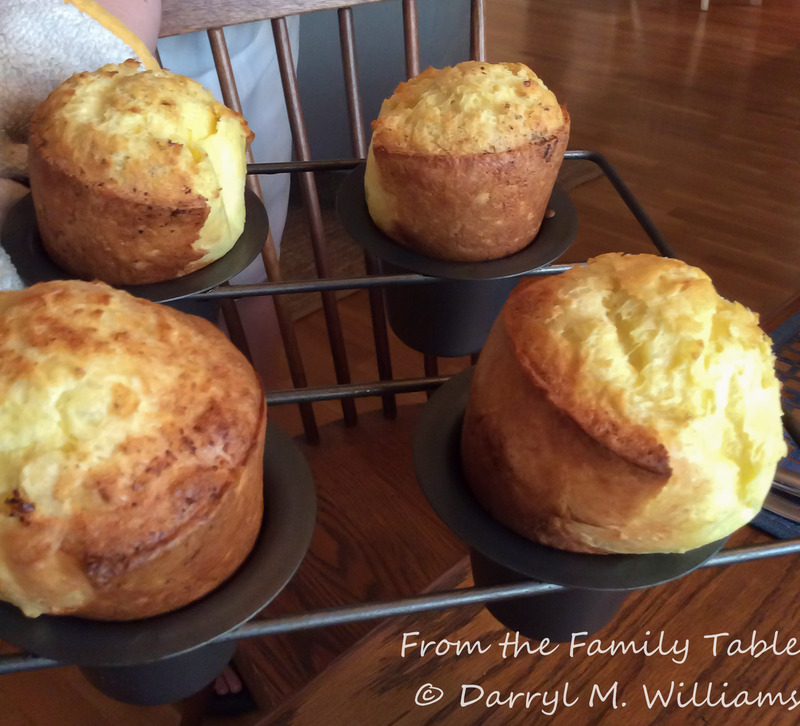 Yields 6 popovers baked in a popover pan or 12 popovers baked in a muffin pan. While working on my recent post about baked oysters New Orleans style, I got to thinking about all of the food I have enjoyed focused on oysters: oysters on the half-shell, oysters Rockefeller, oyster po’boys, etc., etc. I also got to thinking about all of the good meals I have enjoyed in New Orleans. 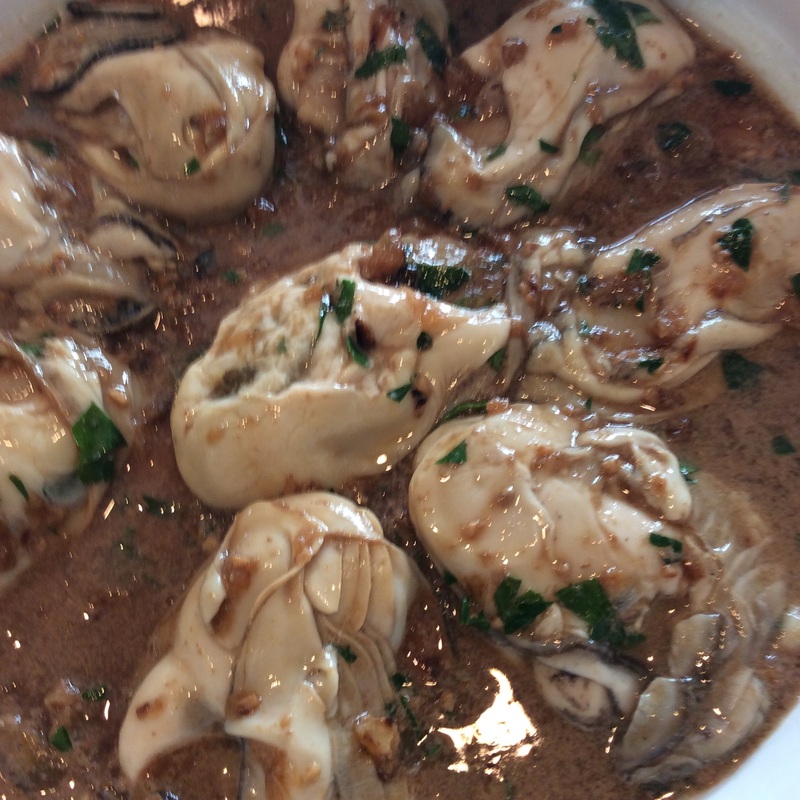 One outstanding oyster dish from New Orleans immediately came to mind: Potage Le Ruth, invented by Chef Warren Leruth and served at his fabled Le Ruth’s Restaurant on the West Bank in Gretna. Before he opened his restaurant, Leruth had gained recognition as a baker, chef and food innovator. He had been personal chef to General Clark when he was in the army in Korea, and he helped to develop the famous Duncan Hines cake mixes at Proctor & Gamble. So it was not surprising when he decided to open his own place in his home town. New Orleans is one of those cities where everyone wants the latest gossip about new restaurants and hot places to go. When Le Ruth’s opened in 1966, it caught everyone’s attention with its creative cuisine. Food critics at the time said that Leruth rescued New Orleans dining from itself because all of the old-line restaurants had started to rest on their reputations and the food had become more or less the same. Le Ruth’s changed all of that and soon gained the reputation as being undoubtedly the best restaurant in the city. That was evidenced by the difficulty in snagging a reservation. It was not the easiest place to get to. You could use the bridge over the Mississippi River, but it was far easier to ride the Gretna ferry from the foot of Canal Street and then catch a cab to the restaurant. I remember clearly the first time I ever ate at Le Ruth’s. A group of colleagues and I were attending a business meeting in downtown New Orleans. 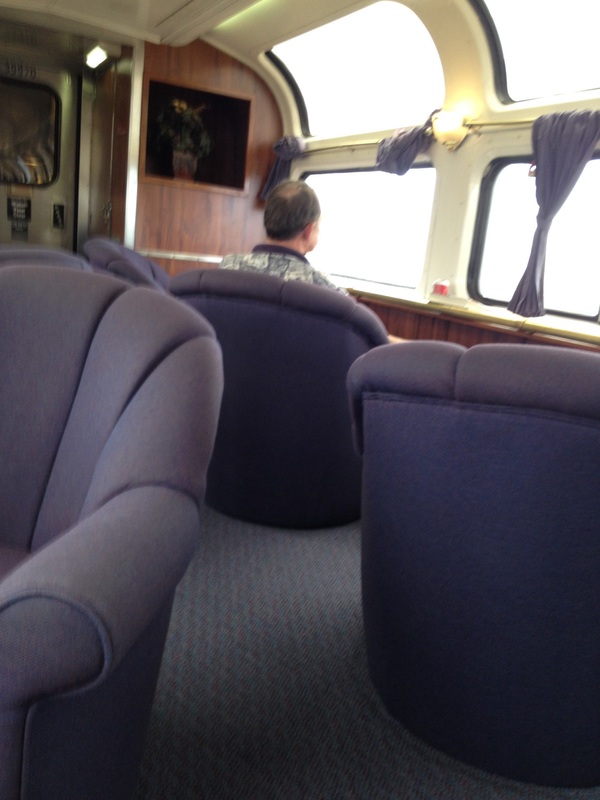 We had made our reservations well in advance, and everyone was looking forward to the experience. We found our way to the restaurant, took our seats at the table and, ordered wine. One of the group stuck two of the corks from the wine bottles in his nostrils when they were offered to him. He announced that the wine was perfect. We all laughed, but two distinguished ladies at the next table raised their eyebrows. I don’t exactly recall, but I believe that at least the wine taster had spent a sizeable part of the afternoon on Bourbon Street. It is a good thing we didn’t get tossed out. Le Ruth had the reputation for responding to critical letters with scathing rebukes from an “anonymous” diner. For folks who gave real offense, he would assign four waiters to the corners of the tablecloth of the miscreant. At a signal, they would lift the cloth to form a sack of food, dinnerware, and wine while Leruth would announce that he “had picked up the check” and summarily declare, “Get out of my restaurant!” I am certain that Warren Leruth would know how to handle the current generation of whiners on Yelp. Le Ruth’s served many delicious and unique dishes, but perhaps the most famous was Potage Le Ruth. Unfortunately, to my knowledge there is no extant authentic recipe. Leruth said that he had the original locked up in a vault. Nevertheless, imitations – none as good – soon showed up on the menus of most of the other high-end restaurants in New Orleans. Then recipes for oyster and artichoke soup began to appear in local newspapers. Many of the knock-offs used cream, but Leruth bragged that his recipe contained no cream. The soup is a sort of rich velouté based on a blond roux, so you really shouldn’t need cream. Surprisingly, some food writers say that Leruth used canned artichokes. My version does, too, although respected New Orleans chefs insist that only fresh artichokes, properly cooked and prepared, will do. If you want to use fresh artichokes, probably four medium are about right. 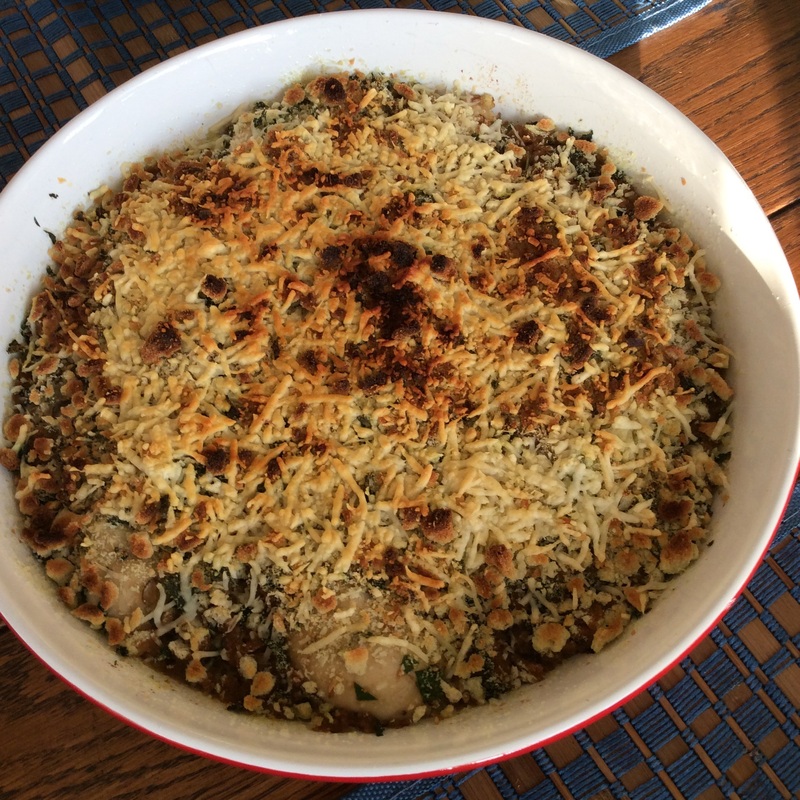 My version is adapted from a recipe that appeared in one of the Shreveport newspapers of the time. Be advised that it is not the real thing. I have taken the additional liberty of adding some whole oysters in the style of an oyster stew. Even though it lacks authenticity, I think you will find it a most delicious soup. Melt butter in the bottom of a heavy soup pot over medium heat. Add the onion, celery, and carrots and sauté until the onions are translucent and the other vegetables have wilted. Do not brown. Add the flour and continue cook over medium heat and stirring frequently until the flour is completely incorporated and the raw taste has disappeared, about 2 minutes. Drain the artichokes and add to the sautéed mixture. Stir in the hot stock, thyme, bay, cayenne, salt and Worcestershire sauce. Simmer partly covered for 45 minutes. With an immersion blender, blend the soup until smooth. Correct seasoning with vinegar and sugar. Add the madeira. If you wish, at this point you may strain the soup through a chinois for an especially smooth soup, or you can omit that step. Return the soup to medium-low heat and stir in the remaining oysters, cooking until they are firm and the edges are curled. Serve immediately or cool to serve later. Then, reheat to the boiling point and serve immediately. Grilled farm-style bread makes a good accompaniment. Mothers’ Day and Susan’s birthday coincided this year, so during our visit to Los Angeles, Carol needed a dessert for our celebration. 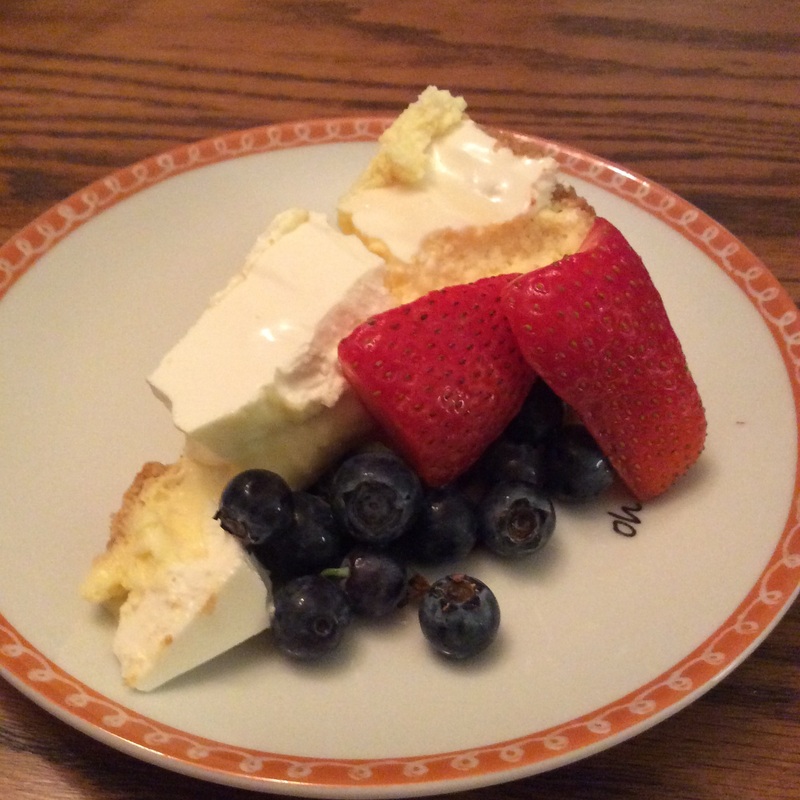 One of Susan’s favorites is cheesecake, and this is one of Carol’s favorite recipes. She originally found it in Gourmet magazine, and it has been published widely since then in other magazines and on the internet. But everyone (or nearly everyone) gives credit to the Three Cities of Spain coffee house in Santa Fe for the original. Many years ago, the popular artists’ street, Canyon Road, was a narrow dirt road heading up the canyon from Paseo de Peralta. The Santa Fe artists’ colony was experiencing a boomlet in the 1950s-1970s, and this was one of the places on Canyon Road where the struggling artists hung out, drinking coffee, smoking, and eating cheesecake. There were nearby bars for more serious drinking at night. 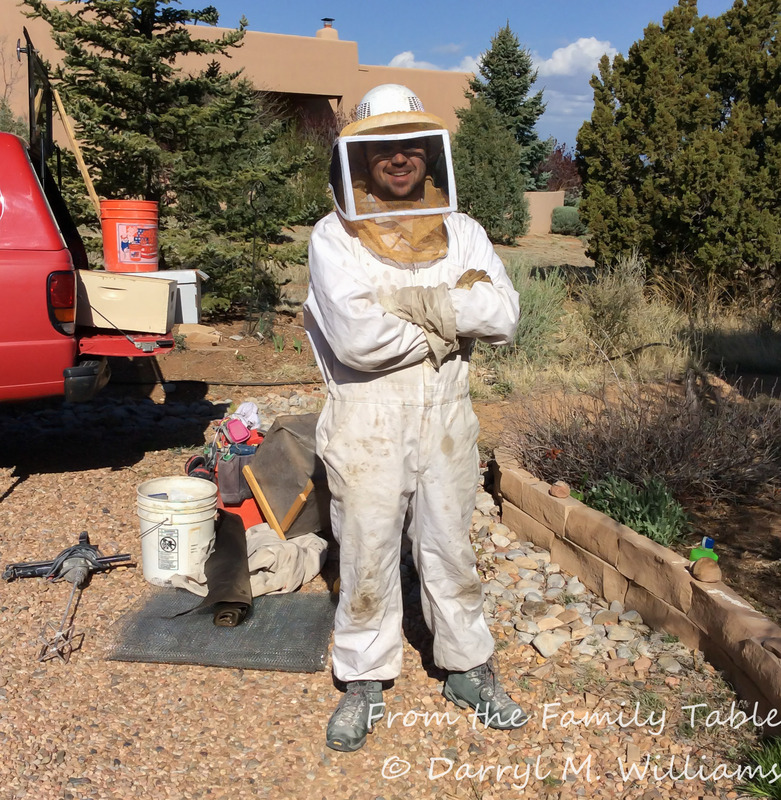 For reasons unknown to me, Three Cities of Spain closed in the 1970s, Canyon Road was paved, and the old adobe home which housed the coffee house was transformed into Geronimo, one of the best and most famous restaurants in Santa Fe. The restaurant was named after the man who built the house in 1756. I think you’ll like the cheesecake. Stir together crust ingredients. Sprinkle half of mixture onto the bottom of a buttered 9½ inch springform pan. Then press the mixture up the side of the pan about 1¼ inches. Sprinkle and press the remaining half of the mixture into the bottom of the pan. 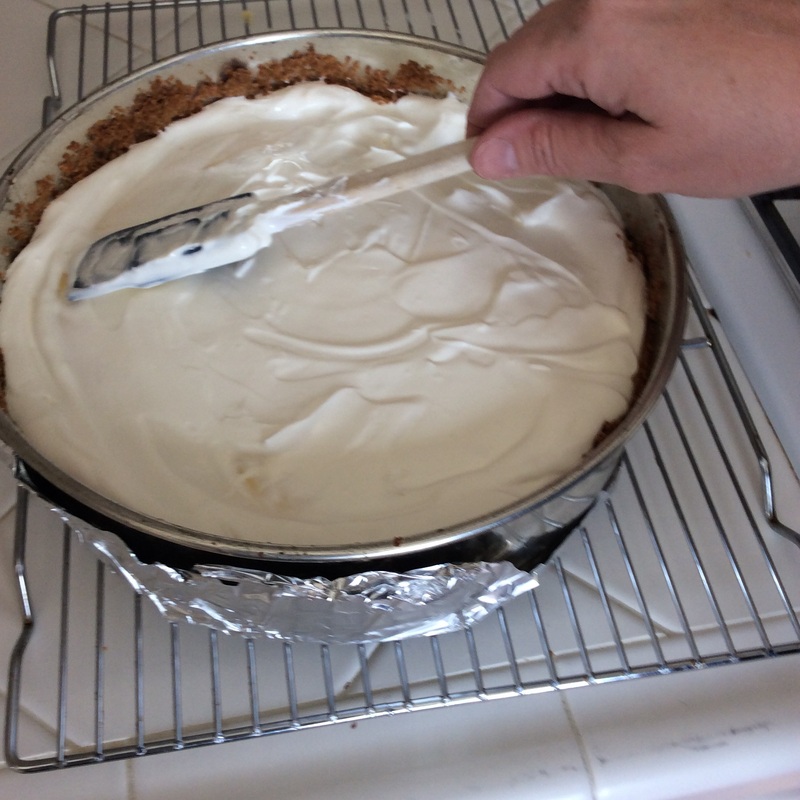 With an electric mixer, beat the cream cheese until light and fluffy. Then beat in the eggs, one at a time. Beat in the vanilla and sugar until just combined. Pour the cream cheese and egg filling into the crust. 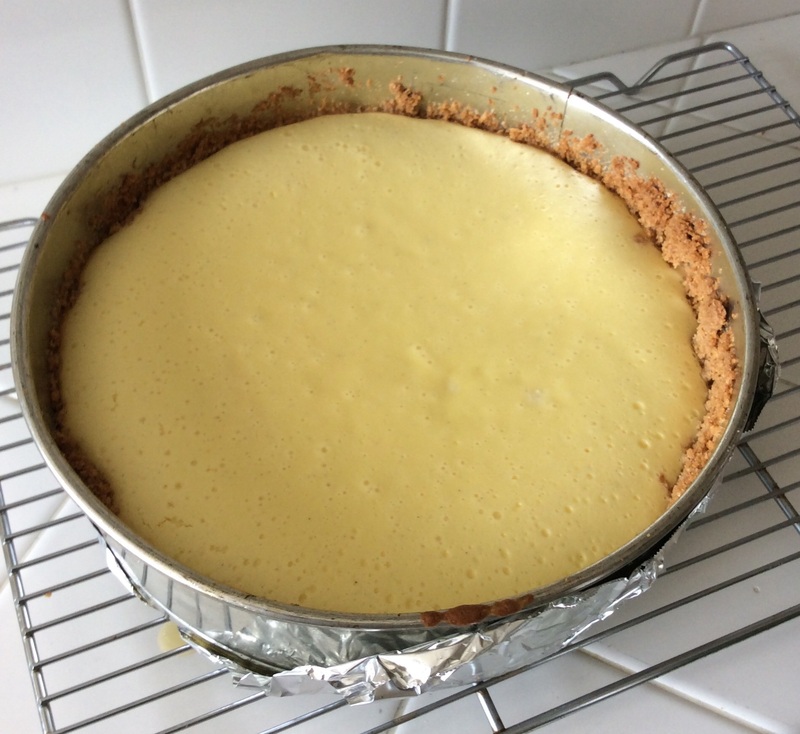 Bake for 45 minutes at 350ºF or until the center of the cake is set. Cool on a rack for 5 minutes. Stir together the topping ingredients. 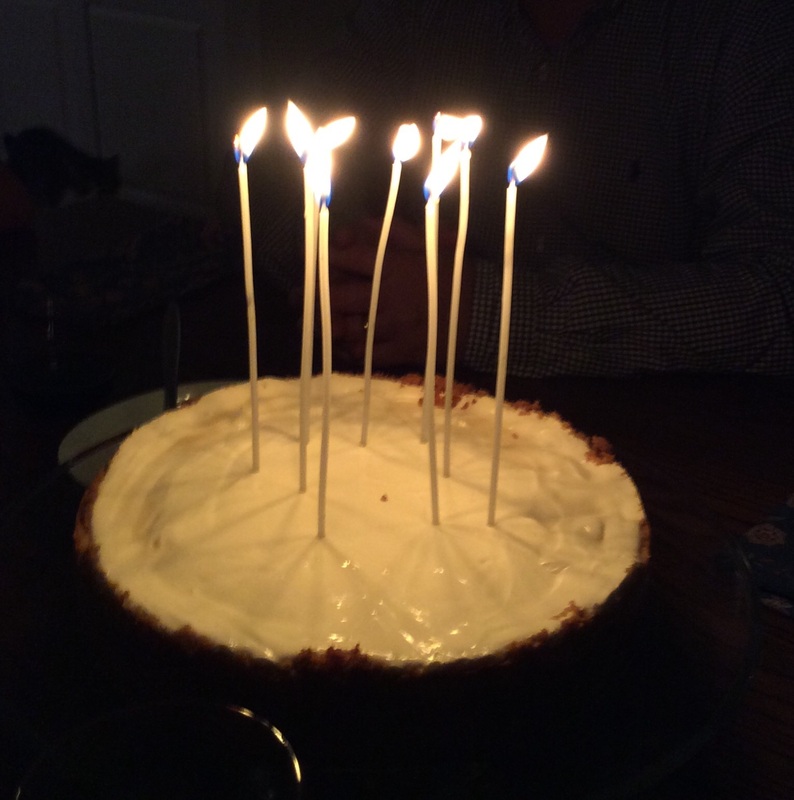 Drop by spoonfuls around the edge of the cake and spread gently into the center. Return to the 350ºF oven for another 10 minutes. Remove from the oven and cool completely on a baking rack before chilling overnight in the refrigerator. Serve at room temperature with or without optional berries. At the end of our train trip from Seattle to Los Angeles, we spent a few days with our daughter, Carol, and her family. She is an excellent cook, and she always tries to make some interesting food during our visits. She also knows that Susan loves oysters, and since she grew up in Louisiana, New Orleans style baked oysters seemed perfect – even though it is May. The recipe in her recipe box is called Oysters Mosska, undoubtedly so as not to get in trouble with Mosca’s restaurant in the New Orleans suburb of Westwego and home to the eponymous Oysters Mosca. Mosca’s is one of the old-line favorite restaurants of local residents, having opened in 1946 and operated by the same family ever since. Part of its charm is that it is not easy to find. It is on Highway 90 a ways after you cross the Huey P. Long Bridge, but it sits back from the road, is a low-slung white-painted clapboard building that looks more like a house, and has only a small, dimly lit sign. When we were living in Louisiana, I drove right by it more than once. An interesting story is that the place was where everyone went after a night spent in the gambling houses that populated this now-lonely stretch of road. As well, rumor has linked the restaurant to the local Mafia, but the Moscas have neither confirmed nor denied that rumor. 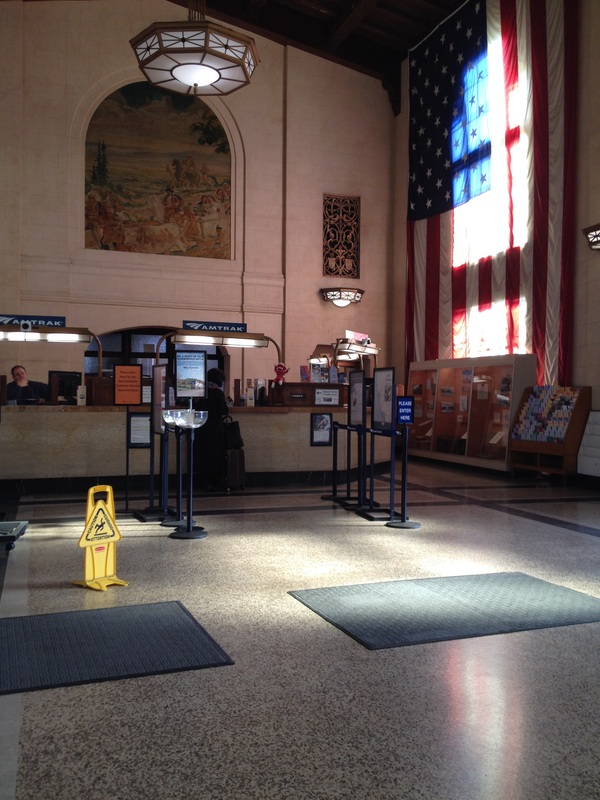 Once inside, you are struck by the liveliness of the place. It is brightly lit and filled with families enjoying themselves. 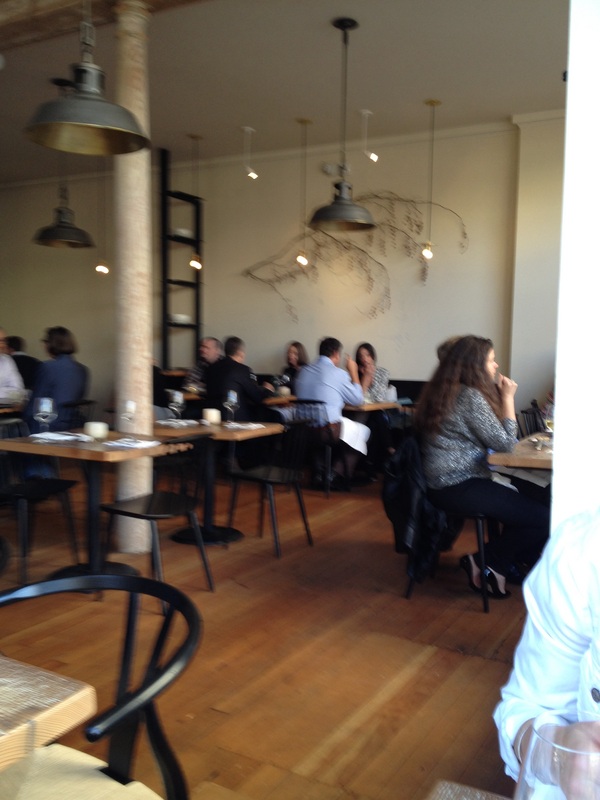 Even with a reservation you may have to wait on the straight-backed chairs lined up against the walls. Th menu is fairly limited but filled with Italian standbys that all have a full quota of garlic. Virtually every table has at least one order of Oysters Mosca. In the old days, the dish would be served in a metal cake pan, and each diner would fish out his or her helping of succulent oysters. To my knowledge the family has never provided an authorized version of the recipe for Oysters Mosca. We have a made-up version in our family cookbook that is a close approximation. As I mentioned above, this version comes from Carol’s recipe collection and is labelled “Oysters Mosska”, I suspect to protect against any accusations of copyright infringement. If you do decide to visit the restaurant, be advised that they do not accept checks or credit cards – cash only. But they do have a convenient ATM inside the dining area. n a saute pan over mediu heat, cook onions untile translucent. Then add garlic and stir for about 1 minute. Add the oyster liquor and the beef stock. Bring to the boil and simmer until the liquids are reduced to about one-half. Add the oysters and parsley. Return to the boil and then remove from heat. Adjust seasoning with Creole spice, salt, and pepper. Transfer to a metal cake pan or a shallow baking dish. 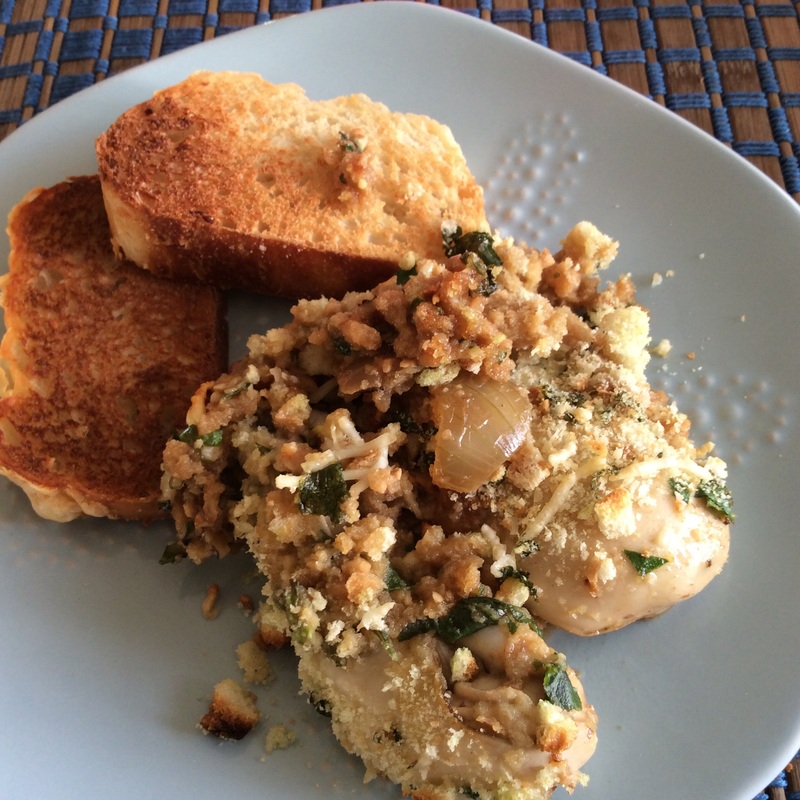 Combine bread crumbs, Parmesan, chopped basil, 1 teaspoon of Creole spice, and olive oil. Sprinkle over the top of the oysters. 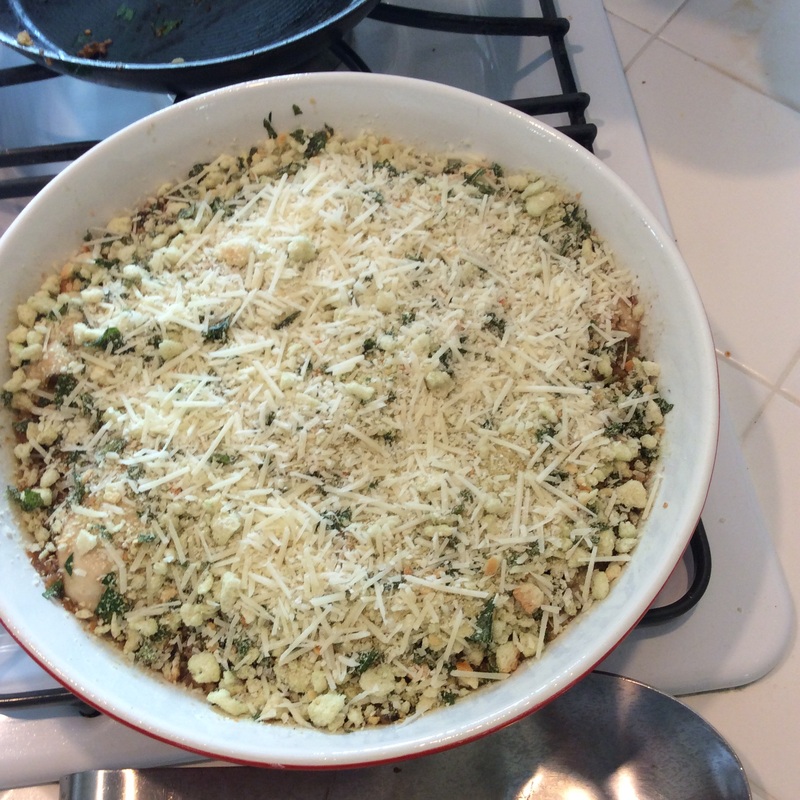 Place under a pre-heated broiler for 8 to 10 minutes or until the top is brown and bubbling. When we’re in San Francisco, Sarah always suggests restaurants for us to try. There are so many places that one never runs out of first-time experiences, but it is always especially interesting to try out a new spot. Sarah and Evan’s friend, Melissa Perello, has operated Frances for a number of years. When the restaurant first opened it was a sensation on the local food scene and was a nominee for James Beard Best New Restaurant. It remains a very popular place. Now Melissa and her fiance, Robert, have embarked on a new venture, taking over the space that was once occupied by Quince when Evan worked there as chef de cuisine. Melissa and Robert have transformed the place. It is filled with light from the floor-to-ceiling windows, and the casual tables and warm but muted colors have made the restaurant inviting and comfortable. Sarah wanted to take me to dinner while Susan got to babysit. That turned out to be what I consider a perfect division of labor. 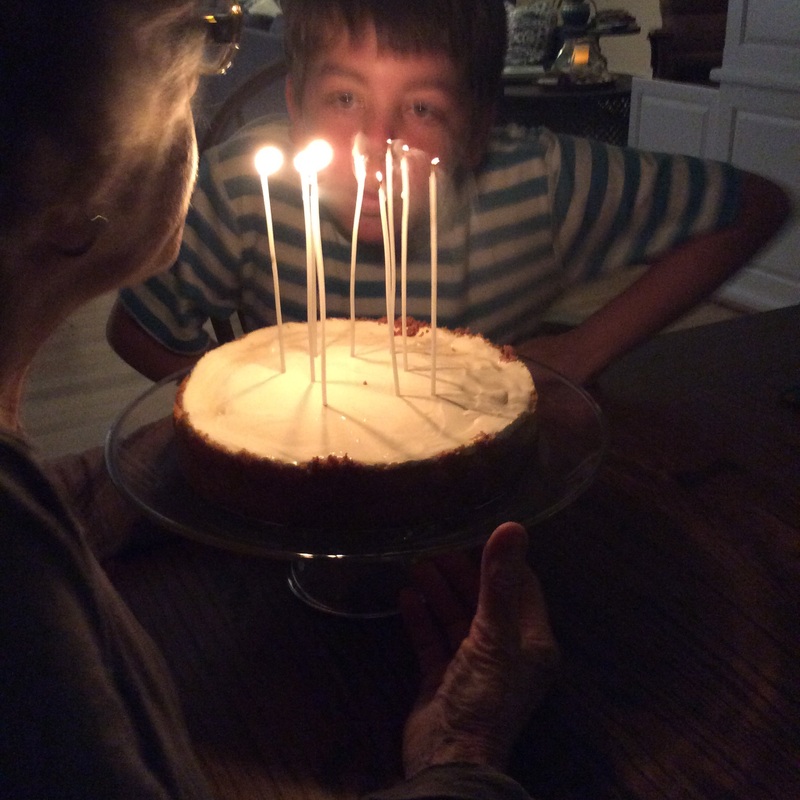 I got to eat – which I love to do – and Susan got to mind the grandchildren – which is one of her very favorite activities. The service was warm and welcoming. Kim, our excellent server, had made a conscious decision to move from another San Francisco standby where she had worked for nine years. She was happy with her decision. All of the other servers seemed as happy, friendly and efficient. Of course, surroundings and service are both essential to a good experience, but in the end it is all about the food. Octavia did not disappoint. As with so many contemporary restaurants, the Octavia menu is designed to encourage sharing of several small plates before the main course. With Sarah’s professional guidance, we chose a half dozen or so small plates to share. First was the “Deviled Egg” with Fresno chile relish, marash pepper and spice. The quotation marks indicated it was not a real deviled egg, and that was so. It was a perfectly peeled mollet egg (That is so hard to do – have you ever tried it?) topped with a spicy red chile sauce. The yolk ran out a golden yellow with my fork attack, mixing with the chiles to form a creamy sauce. 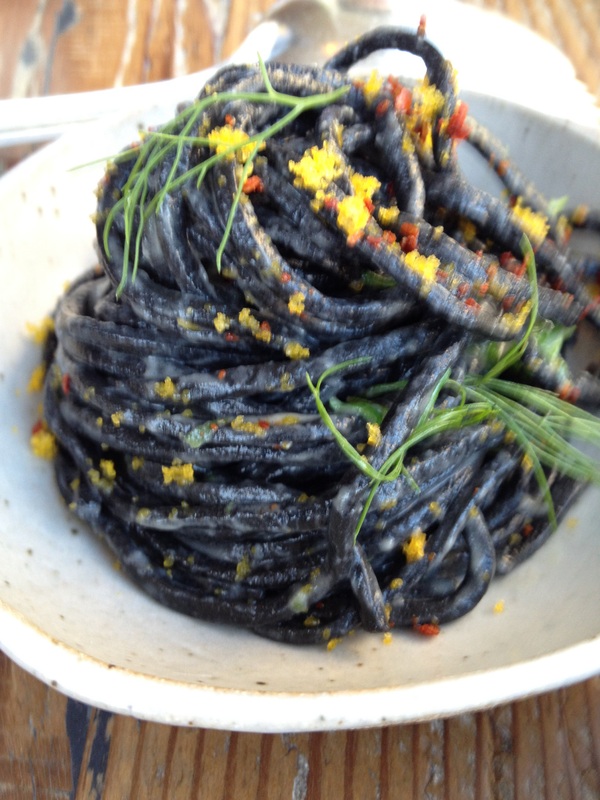 Chilled squid ink noodles with Cortez bottarga (salted fish roe), lemon oil, and green garlic came as a beautiful mound of black noodles dusted with gold. The chill took the edge off of the flavor that can sometimes doom a dish made with squid ink. The flavors of the ingredients came together. All I could think of was that I wanted more. 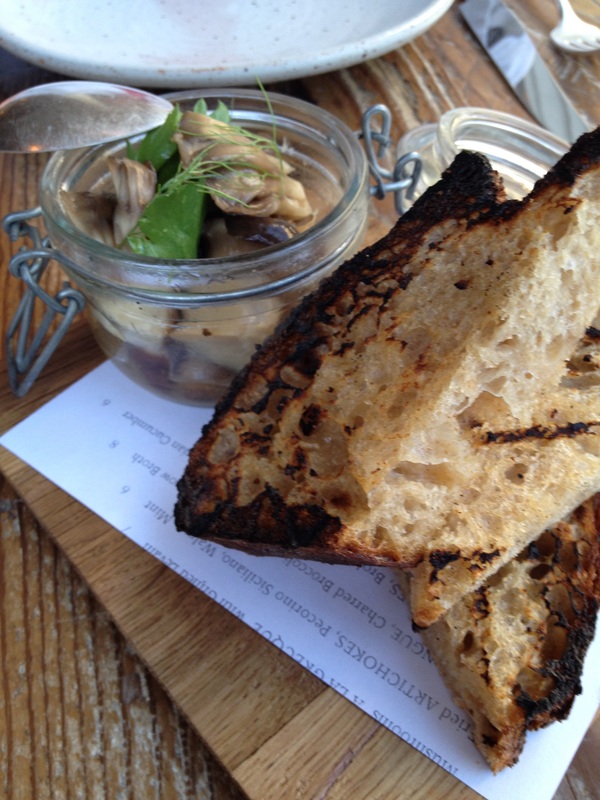 Mushrooms “A La Grecque” were a mix of hens of the woods, trumpets, and shiitakes in a light pickle and served with thick slabs of toasted house-made levain. 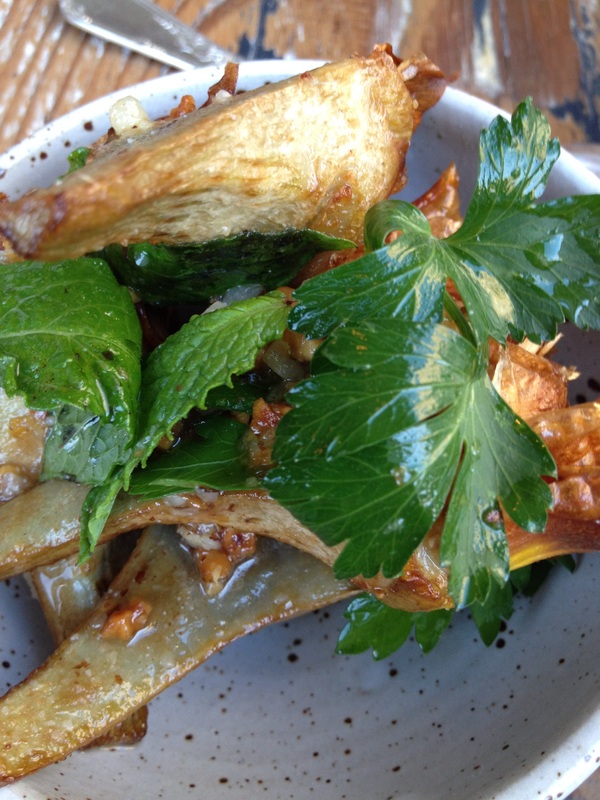 Fried artichokes were crispy on the outside and tender inside with thin shavings of Pecorino Siciliano, walnuts, and mint. If you like artichokes, you would love these. 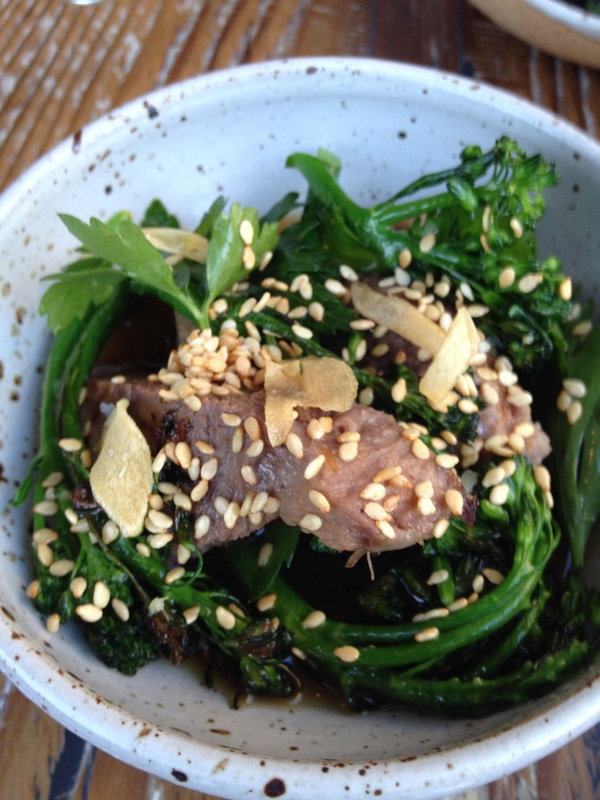 Beef tongue with charred broccoli, toasted garlic, and marrow broth was flavorful. The tongue was so tender and well-cooked that it literally fell apart in my mouth. Some folks are squeamish about tongue, but when it is well prepared it is a great delicacy in the same way that sweetbreads are a special treat. With both, though, you should not plan on having your cholesterol measured the next day. 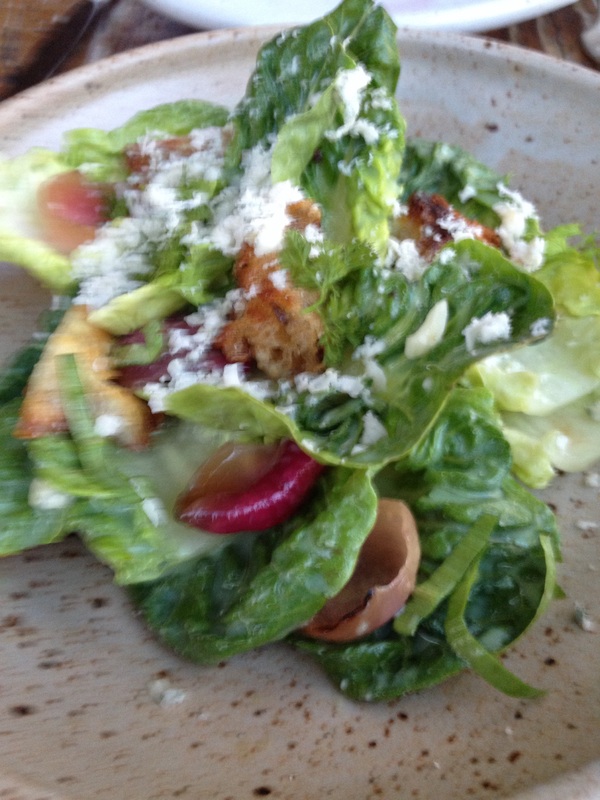 The salad was based on a local favorite lettuce, Little Gems, and tossed with Point Reyes blue cheese, grilled red onions, ramps (at the height of their too-short season right now) and buttermilk. 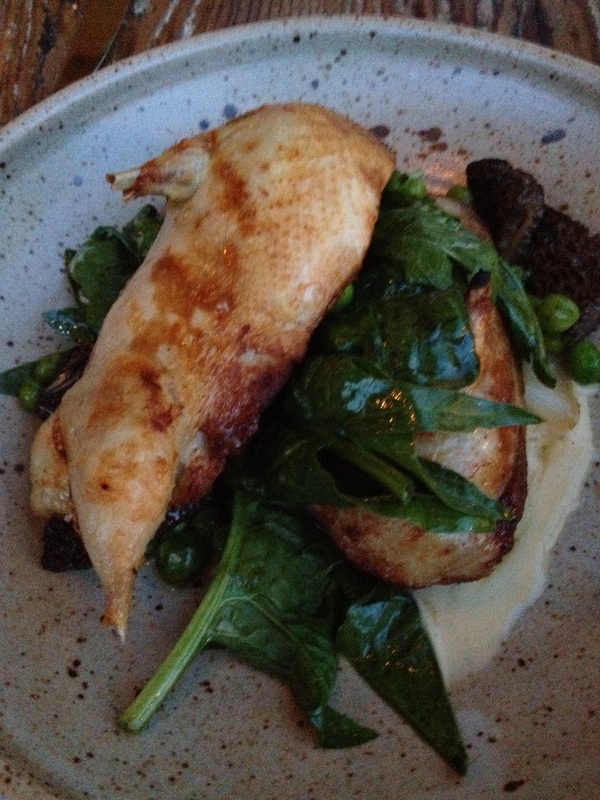 Sarah ordered the quail with morel mushrooms, spinach, and English peas. The quail was perfectly cooked, one of the best signs of an accomplished chef. 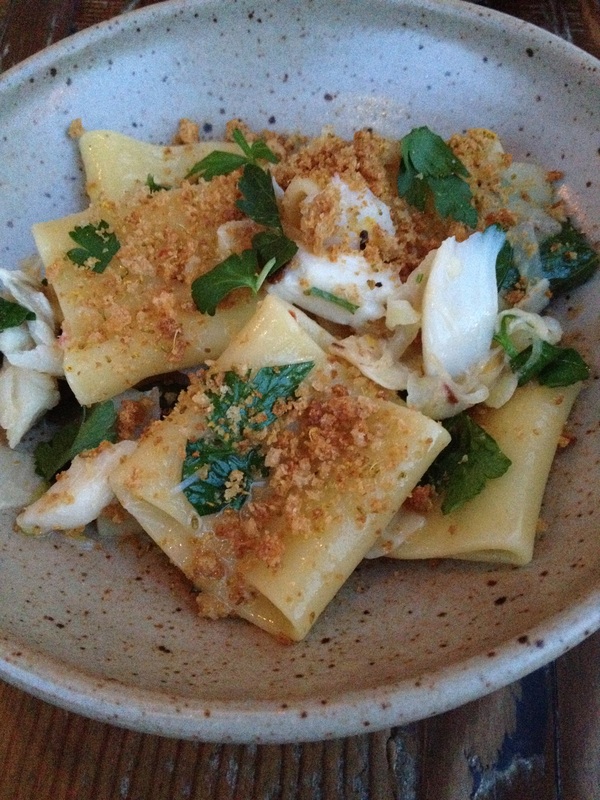 I ordered the paccheri pasta – great big rings – with olive-oil-poached bacalao (salt cod) and fennel pollen. We ordered three different desserts. They were all delicious, but we saved them to take back to Susan, the Dessert Queen, as our thanks for being the resident baby sitter. After dinner, Sarah had a nice visit with a well-known local restaurant reviewer and food critic and her son, a well-known Master Sommelier, who had been sitting at the next table. Chef Melissa also came out and visited with Sarah. It was a very special evening in a new San Francisco restaurant that promises to be a big success.